Intellectual Ventures (IV) is the world’s biggest patent-licensing company and boasts of having collected tens of thousands of patents since it was founded in 2000. It’s raised about $6 billion from investors over the years, and to recoup that money, it started filing lawsuits over patents a few years ago. In 2013, it launched a new salvo, filing 13 lawsuits against major US banks, including Bank of America, JP Morgan Chase, and Capital One. The ‘382 patent, invented by the same Philadelphia patent lawyer who prosecuted it, received a special smackdown from Trenga, who found it invalid on two different grounds. The patent, entitled “advanced Internet interface providing user display access of customized webpages,” dates to an original application filed in 1998. Its principal claim describes sending customized webpages “as a function of the user’s personal characteristics.” But “neither the public nor a person of ordinary skill in the art could reasonably determine the precise metes and bounds of the claimed invention” wrote Trenga. IV lawyers argued that the ‘137 patent was infringed by Capital One’s “account alerts” system, while the ShareBuilder investing website infringed the ‘382 patent. Three other patents that were dropped by IV earlier in the litigation were initially said to cover widely used features of modern banking: CVV/CVC codes on the back of Visa and MasterCard cards, online bill paying, and envelope-free ATMs. Raytheon is switching its UAV control system from Solaris to Linux for U.S. military drones, starting with a Northrop Grumman MQ-8C Fire Scout helicopter. 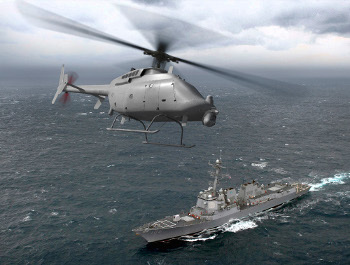 Earlier this month Raytheon entered into a $15.8 million contract with the U.S. Navy to upgrade Raytheon’s control systems for unmanned aerial vehicles (UAVs), according to a May 2 Avionics Intelligence report. The overhaul, which involves a switch from Solaris to Linux, is designed to implement more modern controls to help ground-based personnel control UAVs. Raytheon’s tuxified version of its Vertical Takeoff and Landing Unmanned Air Vehicle (VTUAV) Tactical Control System (TCS) will also implement “universal UAV control qualities.” As a result the TCS can be used in in all U.S. Navy, Air Force, Army, and Marine Corps UAVs that weigh at least 20 pounds. By providing an open standard, the common Linux-based platform is expected to reduce costs by limiting the types of UAV control systems that need to be built and maintained for each craft. When the upgrade is completed in April 2016, the VTUAV TCS will first see action in Northrop Grumman’s 41-foot long MQ-8C Fire Scout unmanned helicopter. The MQ-8C Fire Scout, which is itself a retrofitted Bell 407 commercial helicopter, is primarily used for reconnaissance, but can also be used for precision targeting support to assist other combat aircraft. At the U.S. Navy’s request, Raytheon is converting the VTUAV TCS “block II” system from Sun’s aging, UNIX-based Solaris 8 OS to a “B2VL” version of Linux, says Avionics Intelligence. The company will “continue evolving the system to the military’s new Unmanned Aerial System Control Segment architecture,” says the story. Raytheon will also implement more modern intuitive controls, as well as automate testing procedures, and support software upgrades in the field, says Avionics Intelligence. 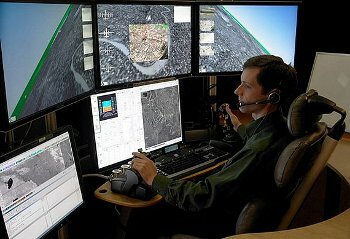 In addition, the company will upgrade the TCS full-motion video capability and shipboard messaging formats, while implementing a new training and simulation capability. Assuming the Fire Scout implementation goes well, the U.S. military will then expand the system to other large UAVs. In addition to U.S. military UAVs, the systems will be used by NATO in its STANAG 4586-compliant UAVs. The TCS can also be configured in racks for ship-based operations, “shelterized” as a land-based system, or integrated into a shelter on land vehicles such as the Humvee. Since the early days of embedded Linux, the U.S. military has been gradually converting selected computer equipment from real-time operating systems (RTOSes), as well as Unix and Windows platforms to Linux. RTOSes, with their greater real-time capabilities, still lead the way in embedded systems, especially in combat, but Linux is increasingly finding a role, especially in systems where advanced user interfaces and wireless communications are important. Back in 2001, the U.S. Navy and GET Engineering announced that the latter’s commercial off-the-shelf (COTS) Navy Tactical Data Systems (NTDS) would switch to Hard Hat Linux, the forerunner of MontaVista Linux, and one of the first embedded Linux distributions. As cost controls were tightened later in the decade, the U.S. Department of Defense increasingly turned to Linux as a way to cut costs by providing common open platforms based on COTS systems. Patent trolls are legal. Can one be nailed for extortion? One man is betting yes. Most business owners sued by patent trolls don’t talk about it to anyone other than their lawyer; a typical response is to cross one’s fingers and hope the problem goes away. It won’t, of course. Often they do the next best thing—hope it will go away for as little money as possible. FindTheBest CEO Kevin O’Connor, who also cofounded online ad giant DoubleClick, decided several weeks ago he would talk about it—publicly, and often. O’Connor wrote to tech sites like PandoDaily telling them of his determination to “slaughter” the troll, the “scum of the earth.” And in August, he pledged $1 million of his own money to fight the troll that went after his company. Now, we’re getting a vision of how FindTheBest is putting that money to use. The company has made a novel legal claim, saying that the troll that came after it is so reckless, it has engaged in outright extortion, violating racketeering laws. That set in motion a bizarre series of events. Lumen View’s lawyer accused O’Connor of committing a “hate crime” by calling the inventor, Eileen Shapiro of Hillcrest Group. (“I didn’t know patent trolls were a protected class,” quips O’Connor.) Then the lawyer threatened criminal charges (again, for calling an inventor). From there, it got personal. Instead of kowtowing to the troll’s demand for $50,000, O’Connor decided to pledge to spend $1 million fighting. He knows it’s not the rational business decision… and he doesn’t care. Spending that kind of cash to fight a patent suit would be devastating to a young startup like FindTheBest, which has received $17 million in venture capital over its short life, according to a recent VentureBeat profile. O’Connor, who sold DoubleClick to Google in 2008, felt like he’s in a position to use some of his personal wealth to push back. In other words, to comply with the demands of litigation, Wasserbauer actually suggested that FindTheBest had to immediately stop using its computers. It’s a long shot any way you look at it. But O’Connor’s tangle with Shapiro, her co-inventor, their lawyers, and any other shadowy investors that may exist, is now set to be a knock-down, drag-out fight. It’s the kind of battle rarely seen in patent troll litigation, where trolls often want to settle for “nuisance” settlements that can be in the high five-figures. O’Connor hopes he’ll encourage other entrepreneurs to speak out. Don’t use Internet Explorer’ — that’s the warning being given by the US and UK governments this week after a severe security flaw affecting the browser was detected. Both countries are advising citizens who are running Microsoft Windows to switch to an alternative web browser, such as Opera, Mozilla Firefox or Google Chrome, until the vulnerability has been fixed. Internet Explorer 6 through 11 — released on Windows 7 and 8 last year — are all confirmed to be affected. News of the vulnerability can’t have come at a worse time for those still running Windows XP. With Microsoft officially ending support for it in April this year, even when a fix for this issue is released the update won’t be made available to the estimated 125 million hold-outs still running the aged OS. As such the advice from the US and UK computer security agencies is even more stark: don’t use the browser at all.